In 2013, North Carolina policymakers accomplished fundamental tax reform, implementing overhauls in multiple areas of the tax code. The multi-bracket individual income tax that topped out at 7.75 percent was replaced with a flat 5.75 percent tax with a generous standard deduction. The corporate tax rate was cut from 6.9 percent to 6 percent in year one, with trigger reductions scheduled to bring the rate to 3 percent by 2017. The sales tax base was broadened to offset some of the revenue reductions. Initial indicators on the effect of the tax changes are positive. The state improved its ranking in the State Business Tax Climate Index from 44th to 16th, tax revenue exceeded projections by $400 million this year. Additionally, the tax reform was paired with unemployment reform, and unemployment rates dropped from 8.3 percent to 6.9 percent in the second half of 2013. Other notable elements of the Senate proposal include a redistribution of sales tax dollars based on population instead of point of sale and a new authority given to counties to levy an additional 0.5 percent local option sales tax for education purposes via referendum. Each of these elements are discussed in detail below. 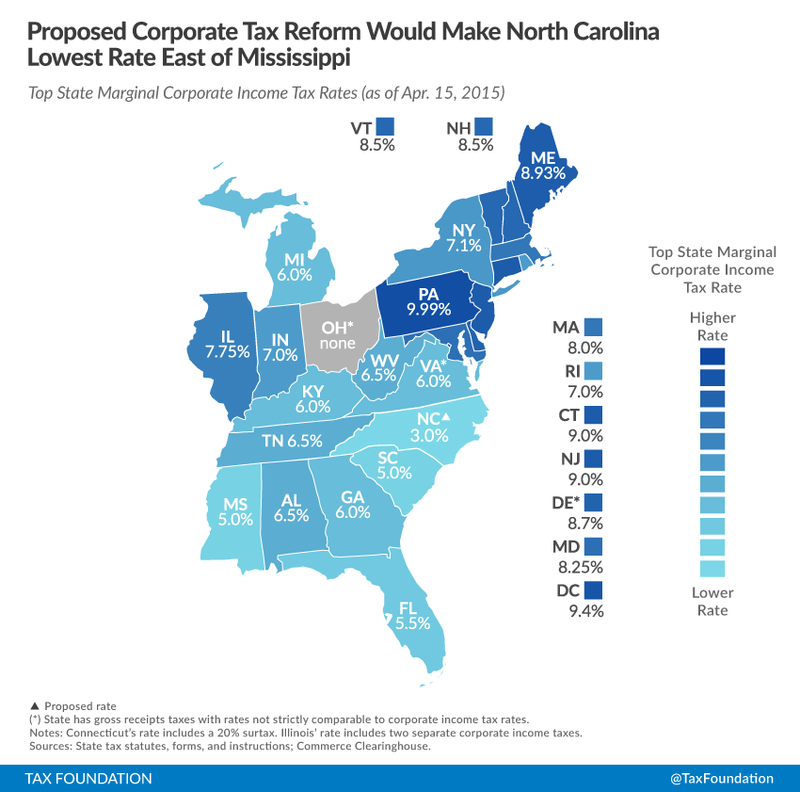 Once fully phased in, the Senate plan is projected to improve North Carolina’s ranking in the State Business Tax Climate Index from 16th to 14th overall, with sizeable improvements in the component tax scores, most notably improving the corporate component score from 25th to 11th (Table 1). One of the key components of the Senate proposal is a reduction in the individual income tax rate from its current rate of 5.75 percent to 5.5 percent beginning in 2016. This is an across-the-board tax cut to the single tax rate, but it is also paired with an increase in the standard deduction, which provides additional tax relief for lower-income tax payers as well. The standard deduction increases are phased in over time (Table 2), such that by 2020, the first $18,500 in taxable income for a married filing jointly couple would be free from income tax. The Senate plan would also reinstate all deductions allowed on the federal income tax, up to $20,000. Many of these were removed as a component of the 2013 reform in an effort to broaden the tax base, but the change has been met with pushback from taxpayers. North Carolina’s 2013 tax reform package brought the corporate tax rate from 6.9 percent in 2013 to 5 percent by 2015. It also included a trigger mechanism to bring the rate to 3 percent by 2017 if certain revenue conditions were met. Because of the $400 million surplus this year, those triggers have been met. Accordingly, the Senate plan removes the trigger language and writes the rate cuts firmly into statute. Once fully phased in in 2017, the state’s 3 percent corporate income tax rate would be the lowest rate east of the Mississippi River (Table 3 and Chart 1). Academic studies find the corporate income tax to be one of the most harmful taxes to economic growth, but it tends to also be one of the smaller portions of the state and local revenue toolkit. For example, in North Carolina in fiscal year 2012, the corporate income tax only generated 3.5 percent of state and local tax collections. For these reasons, cutting the corporate rate can be one of the better bang-for-your-buck tax reform options in that it aids economic growth without hitting state coffers too heavily. Another key element of the Senate proposal is a reduction in the rate of the state’s franchise tax from 0.15 percent to 0.1 percent. The franchise tax has been an unpopular part of the state’s tax code for years. 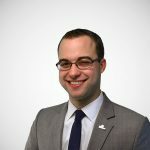 In 2012, Tax Foundation analysts and economists conducted dozens of interviews with North Carolina business owners, taxpayers, legislators, accountants and other policy stake holders as a component of our research for a large publication laying out comprehensive reform recommendations for the state. North Carolina is one of 20 states retaining the once-universal franchise, or capital stock, tax on the net worth of businesses. Described as a “tax on breathing,” the North Carolina franchise tax is a 0.15 percent annual tax paid on the wealth of a C or S corporation. Because the tax is paid in good times and bad, businesses often find themselves using precious cash flow to pay it. The tax raises approximately $700 million per year. In broad economic terms, franchise taxes (or capital stock taxes, as they are sometimes called) are destructive because they disincentivize the accumulation of additional wealth, which distorts the size of firms. Several states have recognized this harmful effect and are moving away from franchise taxes as a source of revenue. West Virginia and Pennsylvania will fully phase out their tax by 2015 and 2014, respectively, and Kansas recently completely repealed its tax in 2011. The reduction in this tax would improve North Carolina’s ranking on the property tax component of the State Business Tax Climate Index, and would reduce the cost of accumulating and maintaining capital. Revenue raisers in the Senate tax plan include an increase in the sales tax on mills, boats, and aircraft to match the general sales tax rate; a cap on the sales tax exemptions nonprofits can claim in a year; and an expansion of the sales tax base to include veterinary services, pet care services, and the installation, repair, and maintenance of tangible personal property. An ideal sales tax base would apply broadly to all consumption, taxing each good or service once and only once at its point of final sale. States vary widely from this ideal, however, with most states leaving a variety of final service transactions untaxed or problematically overtaxing business inputs like raw materials. The Senate proposal does a relatively good job of improving on this. For example, expanding the sales tax to include pet care services is a step in the right direction. Pets are universally adored, but veterinary and animal services should be subject to the same sales tax that consumers pay on other consumer transactions. One provision of the plan where this gets more complex is in the cap on nonprofit sales tax exemptions. Nonprofit organizations in North Carolina are currently exempt from paying sales taxes on purchases they make up to $666,666,667. The Senate plan would make that exemption less generous over the next five years, reducing it to $15 million by fiscal year 2021. In the broad sense, this exemption should be available in an uncapped fashion to the entire business community, as all business purchases of products and services should be exempt. On the other hand, lowering this cap to $15 million would still give most nonprofits an ample exemption. It is also a rather clever way to collect some sales tax from the very largest nonprofits, hospitals, whose final consumer services currently go untaxed even though they ought to be included in the sales tax base. One element of the proposed plan that deserves scrutiny is the provision to reformulate how local sales tax revenues are distributed back to localities after they are collected. The current system allocates locally collected taxes back to the counties mostly in proportion to the taxable sales of each county. The new system, however, would detach localities from their tax dollars by phasing in a formula that allocates the sales tax revenue back to counties based not on sales, but primarily on the number of residents (see Table 4). This process would move local option sales taxes away from being a truly local tax, with the state redistributing collections from more commercial parts of the state to less commercial areas. The North Carolina Senate’s proposed tax reform package improves further on the fundamental tax reform the state made in 2013. Though the package has been sold as an economic incentive plan, it is much more than that—it provides broad-based tax relief across the income spectrum while broadening tax bases to offset some of the rate cuts. Scott Drenkard & Joseph Henchman, Tax Foundation, 2015 State Business Tax Climate Index, Oct. 28, 2014, https://taxfoundation.org/article/2015-state-business-tax-climate-index. Colin Campbell, Projections show $400 million NC surplus, The News & Observer, May 6, 2015, http://www.newsobserver.com/news/politics-government/state-politics/article20331933.html. John Hood, Wall Street Journal, North Carolina Got It Right on Unemployment Benefits, Jul. 4, 2014, http://www.wsj.com/articles/john-hood-north-carolina-got-it-right-on-unemployment-benefits-1404509638. Richard Craver, Winston-Salem Journal, NC Senate Proposes New Tax Cuts, Lowers Funding for Economic Development, Jun. 11, 2015, http://www.journalnow.com/news/state_region/nc-senate-proposes-new-tax-cuts-lowers-funding-for-economic/article_6f79e6ca-0fe2-11e5-bf37-239061fec235.html. Tax Foundation, Facts & Figures 2015, How Does Your State Compare?, Mar. 10, 2015, https://taxfoundation.org/article/facts-figures-2015-how-does-your-state-compare, at Table 8. Joseph Henchman & Scott Drenkard, Tax Foundation, North Carolina Tax Reform Options: A Guide to Fair, Simple, Pro-Growth Reform, Jan. 23, 2013, https://taxfoundation.org/article/north-carolina-tax-reform-options-guide-fair-simple-pro-growth-reform. Scott Drenkard & Jared Walczak, State and Local Sales Tax Rates in 2015, Tax Foundation Fiscal Fact No. 461, Apr. 8, 2015, https://taxfoundation.org/article/state-and-local-sales-tax-rates-2015. North Carolina General Statutes §105-472(a).